3. Remove the top and bottom L-brackets and replace them with the L-brackets that we provide. Mount the L-bracket with label on the bottom, the unlabeled one on top. Use the same screws that came with the monitor, but do not tighten at this point. 4. Turn the monitor over with the screen facing up. Gently place the Q-1947-RK front panel over the monitor. Guide the top L-bracket into the three blind studs on the backside. Then insert a No. 10 flat washer and a 10-32 locknut into each one of the blind studs and tighten. Next, tight the two original screws for the L-bracket. Repeat this procedure for the bottom L-bracket. 6. Use 5” tie wraps to secure the cables if necessary. Then trim all excess lengths of the tie wraps with a wire cutter. 7. The monitor is now assembled. 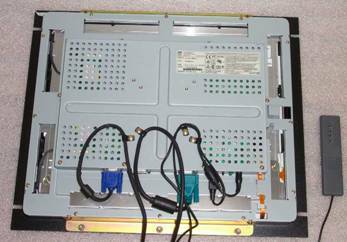 Before mounting it onto a rack, test the rackmount monitor assembly by connecting it to a computer. When done, mount the assembly onto a rack with the four black 10-32 rackmount screws with nylon washers. 8. Congratulations! 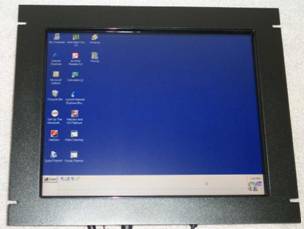 You have completed assembling one of the best-looking 19” rackmount monitor in the world. If you have any questions or comments, please call Harry Lee, 805-484-2454 or e-mail to hlee@flatmonitors.com.